On May 24, 2007, Congress passed legislation to increase the federal minimum wage from $5.15 to $7.25. Speaker of the House Nancy Pelosi captured the general mood in Washington when she exclaimed that “millions of hardworking Americans will be getting a raise.” The public was also supportive, with polls showing broad approval of Congress’ efforts to raise the minimum wage. This enthusiasm was not universal. Labor economists who had studied past wage hikes warned that higher wages were not a free lunch; there would be a price to pay. Decades of prior research established a basic economic truth: When forced to hire and train unskilled new employees at increased wages, employers search for ways to offset that cost. Sometimes, it translates to higher prices for customers; other times, it translates to fewer hours and fewer jobs for less-experienced employees. Three years after the passage of federal wage legislation, teen employment prospects are suffering tremendously. The unemployment rate for 16 to 19-year-olds remains above 25 percent; for those ages 16 to 17, the unemployment rate is close to 30 percent. While the recession has been a significant cause of teens’ employment woes, some advocacy groups have claimed that it’s the only cause – downplaying any employment loss caused by the more than 40 percent increase in the federal minimum wage that occurred over the same time period. In this study, labor economists William Even (Miami University) and David Macpherson (Trinity University) quantify how much teen employment declined due to increases in the federal minimum wage. The authors use Census Bureau employment data collected between January 2005 and April 2010, and follow a well-established empirical technique first initiated by labor economists Richard Burkhauser (Cornell University), Kenneth Couch (University of Connecticut), and David Wittenburg (Urban Institute). Using state-specific variations in minimum wage growth, and carefully controlling for the effects of the recession and other state economic differences, Even and Macpherson are able to isolate only the decline in teen employment that was caused by the federal wage hike. For the 19 states affected by all three stages of the federal wage hike, there was a 6.9 percent decline in employment for teens aged 16 to 19. This translates to approximately 98,000 fewer employed teens. 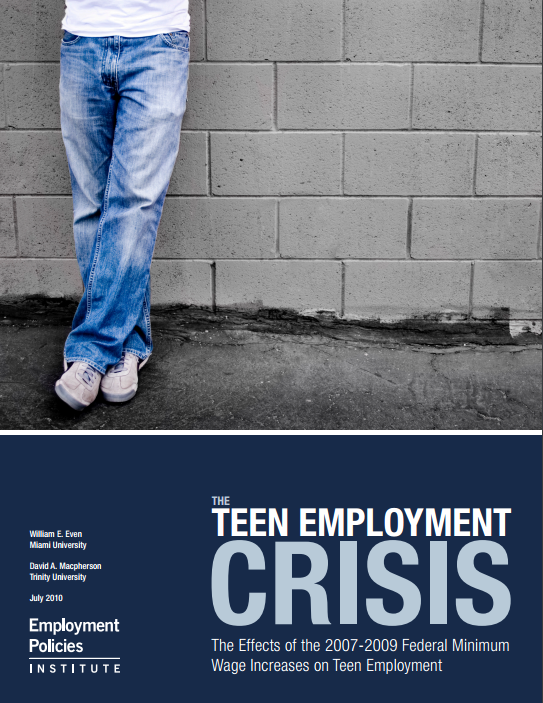 Broadening the analysis to include all 32 states impacted by any stage of the federal wage increase, the authors find approximately 114,400 fewer employed teens. When Even and Macpherson look specifically at 16 to 19-year-olds with less than 12 years of education, the proportional employment loss grows larger. In states impacted by all three wage hikes, there was a 12.4 percent decrease in teen employment. These estimates are conservative. University of California-Irvine labor economist David Neumark, writing in The Wall Street Journal in 2009, predicted minimum wage-related teen employment losses of a magnitude 300,000 or greater. Even and Macpherson measure contemporaneous job loss in this study, but note that employment losses could be considerably larger if employers reacted to the increased labor costs with longer-term reductions in hiring, due to an increased reliance on self-service or automation. Even and Macpherson’s research demonstrates that these employment reductions are very real, and felt most by teens with the least amount of education and experience. Future debates on a higher minimum wage should take careful account of the policy’s unintended consequences.